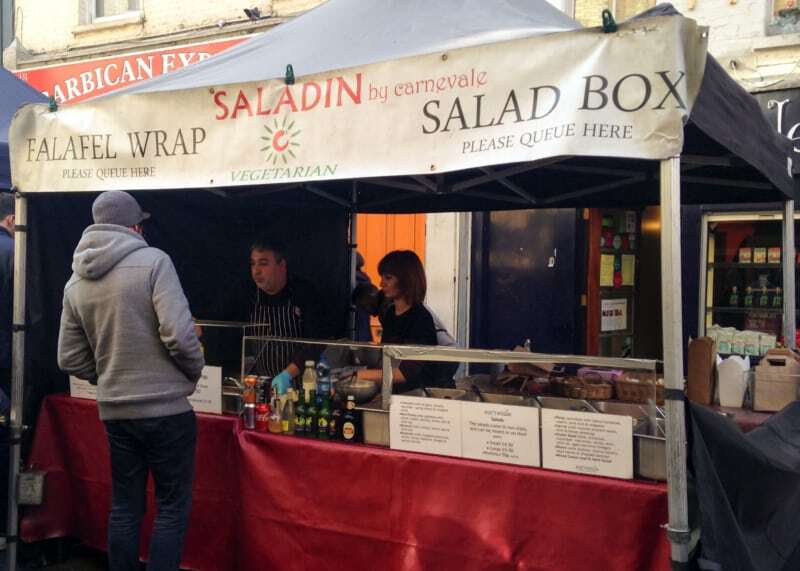 Saladin is a popular food stall in East London's Whitecross Street Market, offering healthy vegetarian and vegan lunches. Every weekday lunchtime, Saladin serves delicious fresh salads and falafel wraps to hungry office workers and passersby. It’s run by Carnevale, the veggie restaurant it stands outside. 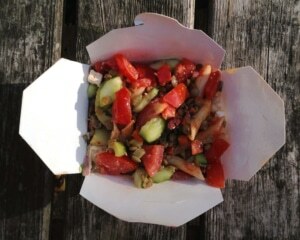 The salad boxes come in two sizes: small and large, which are £4.50 and £5 respectively. The ‘small’ box is by no means small – it’s a miracle it closes given the amount of salad that’s packed in. You can choose from a range of vegan and veggie salads that are expertly seasoned and dressed. There’s pasta, carrot, Greek salad, beans, mixed greens, tabouleh, new potatoes, broccoli, beetroot and stuffed vine leaves. For an extra 50p, you can enjoy a generous helping of hummus. The falafel wrap is served with baba ganoush and salad for £5. You can add halloumi for an extra £1. Like the salad boxes, the wrap is a good size and a satisfying lunch. There are two queues at the stand – one for wraps, the other for salad boxes. They can get long, but thanks to the speed of the friendly staff, you’ll be enjoying your lunch in no time.